Anyone use Dry Lube for their chain? Even though lubing the chain takes all but 2 minutes, it is something I detest. It is like hanging up your jacket instead of just throwing it over the couch. It takes no time but for some reason it is such a PITA. "I'll do it later" is commonly heard here. I've always used standard lube for my chain every 250-350 miles if it rains or about 400-500 miles if it is dry. The overspray always gets on my wheel and is difficult to remove without something like engine degreaser. Not to mention the chain gets filthy and requires cleaning. I use Maxima's chain wax, never had any problems. As for cleaning wheels, I use WD-40 on a shop rag and it cleans it no problem. So dry lube is polytetraflouroethylene, PTFE, commonly known as Teflon. We know it's slippery stuff and is an excellent lubricant, but it has issues. Chief among my concerns would be that PTFE isn't compatible with oil and heat. A quick experiment with a cheap nonstick pan, a small amount of oil, I prefer avocado, and heat the pan to about 500°F for a few minutes should destroy the nonstick surface. Or you can read any manufacturers care instructions and they tell you not to do that. Most chains are packed with grease and my chemistry background would tell me to remove that packing before using PTFE based lubricant and then only use that type for the life of the chain, no mixing. This route you should be fine, but I worried about causing issues with the seals on a new chain doing that. I personally wouldn't use it on a motorcycle, they're just too much going on and the chain moves way too fast. My cousin uses it on his race road cycles, but it's a different thing altogether. I do exactly what Kooma does. Maxima chain wax and WD-40. albatrosscafe, HalcyonSon and ghettod like this. I used that DuPont spray-lube that everybody used to recommend for chain maintenance, and it worked okay for the life of a couple chains on my old Weestrom. I do prefer just the plain ol' black spraycan Maxima wax that Kooma mentioned above though. It's cheap and they seem to sell it everywhere. I just cut a little L-shaped piece of cardboard to sit behind (and below) the chain to catch overspray and drips. I've been meaning to try out Go Wax (this stuff). Anybody tried it? Ok, I'll stay way from the dry stuff, thanks for the info. Doesn't sound worth it. I'll try a pizza box behind or something when I spray. I don't have a rear wheel stand so it makes it a little harder. 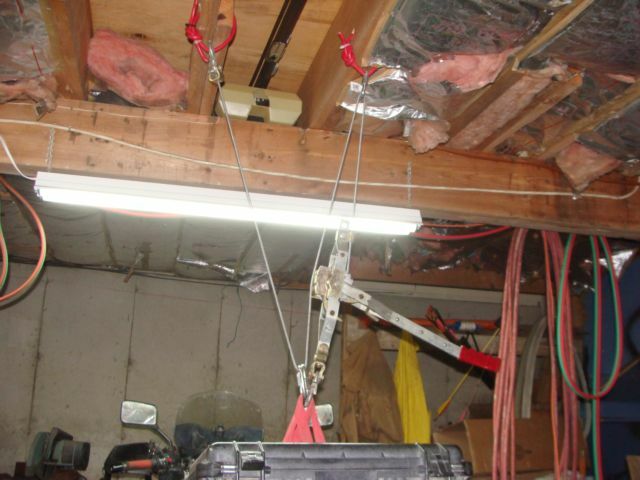 How about a Harbor Freight lift or just some come-along straps under the swingarm leading up over a sturdy rafter or something? I did something like this before I broke down and just bought a lift. I use Tirox Chain Wax. 12000 miles on the original chain on my Triumph, using only Tirox. Still looks brand new. As for belt drive... there's a reason no one uses belts on sport bikes anymore. I've been using Bel Ray Blue Tac since last year after reading some reviews. It goes on thin, seems to last well without collecting dirt, and cleans off well (i use the maxima chain cleaner). I can get a good coating on the critical chain parts without it building up. I actually spray Dry Lube 620 3-8 ( Ty8) on a daily basis, steel and titanium have to be baked a 375F for at least an hour after application. You guys ain't talkin about this chit are ya? That's what your chain came packed with from the factory. Why would you want to use anything else? I used a piece of cardboard for a while so as to not spray it all over the wheel. Then I learned to just be a little careful. Cleans easily with Simple Green. Too easy to get too much on a chain and have it fling friggin everywhere... I white lithium grease on bearings and axles and other things rotate. My DR650 gobbles that stuff up. THIS GUY DOES WITH NO PROBLEM, HE WENT THE WHOLE TRIP DOING THIS. While waiting for the washer, I used my Trail Stand to jack up the rear wheel. I cleaned and lubed Tess's chain. There appears to be NO wear after almost 8000 miles. I use DuPont Teflon lube. Goes on wet then dries with a light film. Best I've found in 45 years. Plus you can get it at Walmart for around $10 a can. I keep the clean chain using wet wipes. Simple and easy to just give the chain a quick wipe down and light spray at the end of each day. may i ask this: when you guys same some product or other "works"...what is your meaning of that? I mean - how do you define "works"? I just use the blue can of whatever...PJ1? from the shop. My chains last a long time, and I only seem to have to change them when I want to do sprocket swaps or something. Granted, I am not a maniac or a long distance rider, really. so, what determines, for you, a product that "works"?